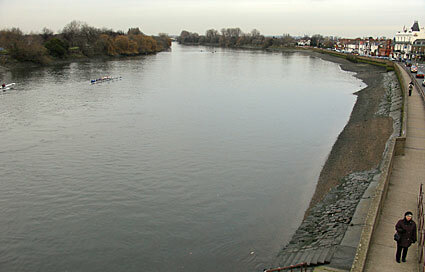 Looking across the Thames to Lower Mall, Hammersmith. 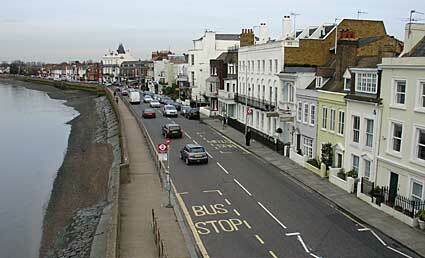 The walkway is popular in the summer months with drinkers enjoying the two pubs offering views overlooking the river; the Rutland pub (far left) and The Blue Anchor (white building two doors down). 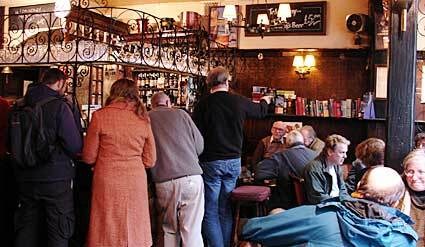 The Blue Anchor dates back to the 18th-century pub and its tiny, well-worn interior can get very crowded. I recommend paying the pubs a visit: one of life's pleasures is watching the illuminated Hammersmith Bridge being bathed in the dying rays of the sun after a long summer afternoon's drinking on the outside tables! 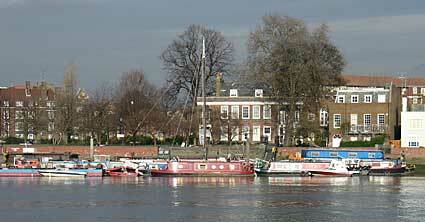 The brightly-coloured old houseboats moored up on the north bank of the Thames add to the period feel of this photo. 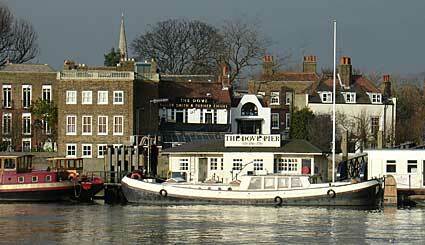 Accessible through a narrow alleyway, the Dove is an attractive 17th century riverside pub offering good food and excellent beer. 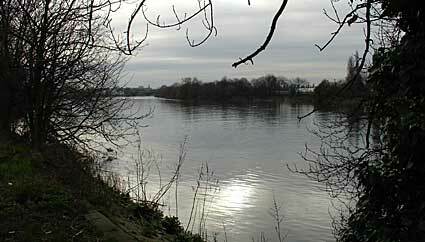 On the opposite bank from this view is Chiswick Eyot (pronounced 'eight') a long narrow island on the Thames. The island suffered so much erosion during the 20th century that its eastern tip disappeared by 1948. Local council restorative action in the 1970s resulted in this uninhabited island being preserved. By this time, my ears were starting to ring from persistent 'how much further?!' demands from my thirsty/desperate-for-the-loo fellow walkers. Happily, I was able to point to the 1849 Barnes Bridge looming in the distance, a combined rail/pedestrian bridge, linking the pubs of Chiswick to the pubs of Barnes! After all that walking a pint was definitely in order. 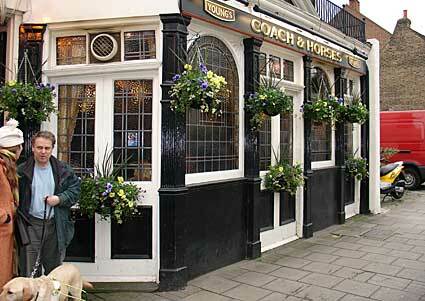 We rolled into the Coach and Horses, 27 High St, Barnes for some Youngs beers. Originally a coaching inn, the pub offers a pleasant solid rural charm, with much fancy ironwork, leaded glass windows, piles of books, wooden beams, rough plaster walls and a fine brick open fire. 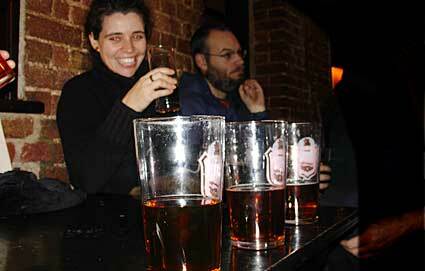 The pub seemed friendly enough, and was busy with the usual assortment of Saturday afternoon drinkers: i.e. old fellas, tourists and wheezing walkers (i.e. us). Looking down from the bridge you can see The Terrace, a row of early 18th Century houses commanding fine views across the River Thames. It is thought the town got its name from the Anglo-Saxon word for a barn (it was known as 'Berne' or 'a barn' in the 11th Century). The Domesday Book records Barnes as being controlled by the Dean and Chapter of St.Paul's Cathedral, having been granted to them by the Saxon King Athelstan around the year 930. Well known as one of the prominent landmarks at the closing stages of the University Boat Race, the three-arch, cast iron Barnes Bridge was built by Joseph Locke and Thomas Brassey. The bridge was built to carry the Windsor, Staines and South-Western Railway's line from Barnes to Feltham, and increased traffic led to the bridge being strengthened in 1891-95, with a footbridge being added on the downstream side. The railway used to park special train services on the bridge to give spectators a great view of the boat race and the footbridge was also made especially strong to support the crowds on Boat Race day. Sadly, the footbridge is now closed to pedestrians during the race. The Thames-facing Chiswick Mall offers what feels like a walk through a bygone era, with the narrow road passing a long row of 17th-18th century mansions. 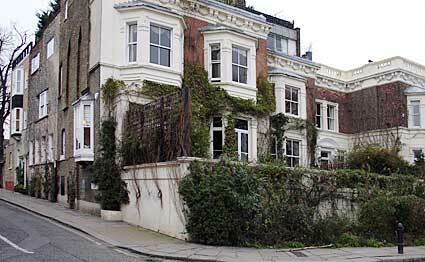 There's a host of different architectural styles on offer, with many houses having private gardens that go right up to the Thames. Note the stout gate - many of the houses have had to protect themselves from occasional Thames flooding. Another view of one of the sumptuous properties along this desirable address. 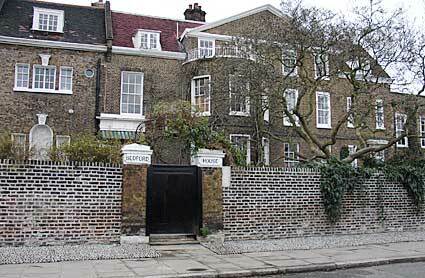 Nearby is Kelmscott House, which now serves as the headquarters for the William Morris Society. 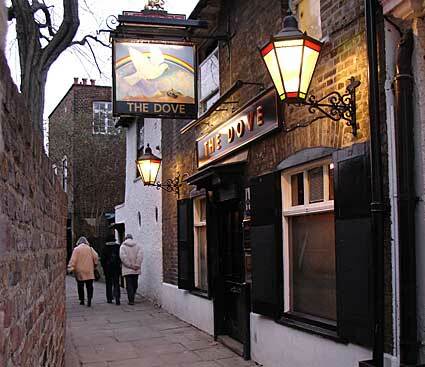 Formerly a coffee house in 1796, the Dove was popular with writers like Graham Greene and Ernest Hemingway. James Thomson (the writer of 'Rule Britannia') lodged and died there. 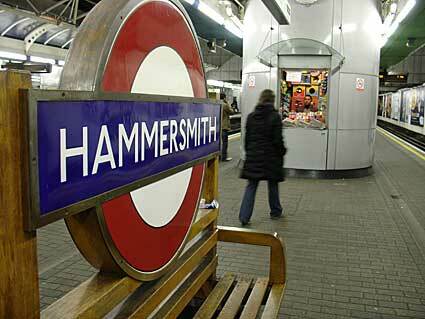 William Morris lived next door and it's claimed that Charles II and Nell Gwynne had secret rendezvous in the pub. Inside this 300 year old pub there's a very small public bar to the right, reputed to be one of the smallest in Britain. If you get there early enough, you can bag a space on the outside patio and watch the river rolling by. The end of the walk! 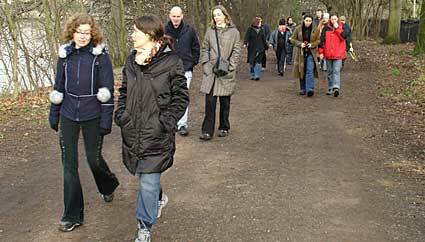 After a bracing six and a half mile walk - and several beers - the walking team headed for home to get brushed up and ready for the evening's drink at the People's Republic of Disco in Windmill, Brixton Hill.